There’s something about spring that just makes me think, asparagus, asparagus, asparagus. I am drawn to asparagus like a moth to a flame, and while I am always perfectly happy to have it steamed with just a drizzle of olive oil and sea salt, if I can incorporate it into a full-on elegant dinner, so much the better! That’s one of the things I love about this recipe. The other is that it is one of those priceless recipes that you can pull out for a fancy dinner party…or make on a regular old Tuesday night. That’s how quick and wonderful it is! For the all-important asparagus, while the thicker ones will work just fine, I like the thinner stalks for this one. There’s something so delicate and scrumptious about them, and this is the time of year when they start getting easier to find. As for the veal, pound it thin if it’s not thin already. You’re going to want to cook it fast so it stays tender, and the thinner it is the less time it will spend in your frying pan. And last but not least…the mozzarella. There is a place in Secaucus called Vito’s Bakery, and while I’m sure their bakery goods are amazing, their mozzarella is completely, totally, utterly Out Of This World. It’s ruined me for all other mozzarellas….if I can’t get Vito’s mozzarella, we don’t have mozzarella. So if you are lucky enough to live anywhere near Secaucus…Vito’s. You heard it here first. If you don’t, just go for the best fresh mozzarella you can find. It will make this dish sing. Well, that and the asparagus. 1. Preheat oven to 425. Place asparagus on baking sheet, drizzle with olive oil and season with salt and pepper. Roast until tender, about 12 minutes. 2. Season veal with salt and pepper and dredge in flour. Heat 1 tablespoon each of butter and olive oil in large skillet over medium high heat and cook veal for two minutes on each side. Remove veal from pan and set aside. 3. Add remaining butter to pan along with wine and lemon juice and bring to simmer. 4. 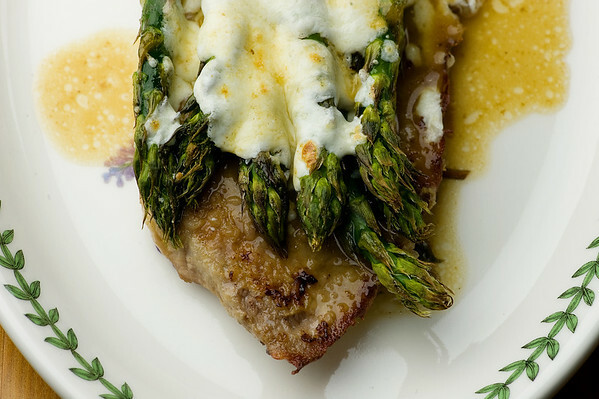 Place asparagus in baking dish, top with veal and sliced mozzarella and run under broiler until cheese melts. Top with pan sauce. Kate Morgan Jackson is an editor, photographer, and writer. Her cooking and photography blog, Framed Cooks, is a collection of recipes and pictures designed for the busy cook, and her posts have been featured on a variety of sites including Glamour, Saveur, The Pioneer Woman, Steamy Kitchen, The Kitchn and Design Crush. She is a natural light photographer who specializes in portraits of children, animals and of course food of all kinds. Kate is a long-time resident of New Jersey, currently residing with her husband, daughter and rescued redbone coonhound in Upper Saddle River. Music, food (cooking and eating), travel, progressive politics, and writing about any combination thereof.